Sci Rep, 2014, 4:7310. Rigosertib (ON-01910) purchased from Selleck. Along with cell death, immunoblotting shows ON 01910.Na induces hyperphosphorylation of RanGAP1, increased expression of RanGAP1.SUMO1 but decreased expression of free unmodified RanGAP1. No viable SU-DHL-5 cells were available for immunoblotting at 0.5 uM of ON 01910.Na. PLoS One 2013 8(11), e79863. Rigosertib (ON-01910) purchased from Selleck. Rigosertib (ON-01910) purchased from Selleck. Dr. Antonino Maria Sparta, PhD University of Bologna. Rigosertib (ON-01910) purchased from Selleck. Recombinant PLK1 (10 ng) is incubated with different concentrations of Rigosertib in a 15 µL reaction mixture (50 mM HEPES, 10 mM MgCl2, 1 mM EDTA, 2 mM Dithiothreitol, 0.01% NP-40 [pH 7.5]) for 30 min at room temperature. Kinase reactions are performed for 20 min at 30 °C in a volume of 20 µL (15 µL enzyme + inhibitor, 2 µL 1 mM ATP), 2 µL of γ32P-ATP (40 μCi), and 1 µL of recombinant Cdc25C (100 ng) or casein (1 μg) substrates. Reactions are terminated by boiling for 2 min in 20 µL of 2× Laemmli buffer. Phosphorylated substrates are separated by 18% SDS-PAGE. The gels are dried and exposed to X-ray film for 3-10 min. Concentrations: 1 nM - 10 μM, dissolved in DMSO as stock solution. Gumireddy K, et al. Cancer Cell, 2005, 7(3), 275-286. Reddy MV, et al. J Med Chem, 2011, 54(18), 6254-6276. Chapman CM, et al. Clin Cancer Res, 2012 18(7), 1979-1991. BI 2536 : Pan-Plk1, Plk1, IC50=0.83 nM; Plk2, IC50=3.5 nM; Plk3, IC50=9 nM. BI 2536 : Plk1, IC50=0.83 nM. 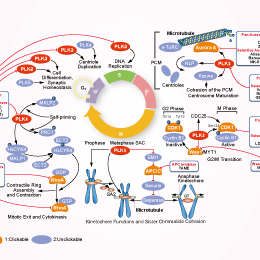 Volasertib (BI 6727) : Phase III for acute myeloid leukaemia. 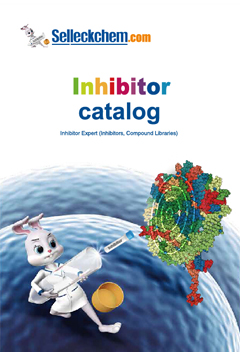 Features:The first potent and selective Plk1 inhibitor that induces all hallmarks of Plk1 inhibition.